Living Areas: The majority of Uygur ethnic people in Xinjiang live in the areas of Hotan, Kashi and Aksu, south of the Tianshan Mountains. Population: According to the 2003 census, there were 8,823,500 Uygur residents in Xinjiang. With 45.62 percent of the region’s population they are its largest ethnic group. Language: The Uygur language belongs to the Turkic branch of the Altaic language family. Its written form is based on Arabic script. History: The word “Uygur” itself means “unity” or “alliance,” describing the ethnic group’s formation. Their origins can be traced back to the 3rd century BC. Nomads calling themselves Dingling used to live on the steppe by Lake Baikal. In the 5th century the tribe was called Tiele. An alliance was formed between them and other nomadic tribes against Turkic invasions in the 7th century, and the name Uighur (now spelled Uygur) began to be used. In 840, however, the Turkic Kirghiz conquered the Uighur Khanate. A majority of the Uighurs then moved westwards into the Western Region. There, nomadism began to give way to settled farming. The Uighurs mixed with native Yutian, Shule and Guizi people who lived on the rim of the Tarim Basin, as well as Han settlers who migrated to the region during the time of the Han Dynasty (206 BC – AD 220). This group later intermingled with Tibetan, Khitan and Mongolian tribes as well. By the early 13th century, the Uygur ethnic group had taken its present shape. Economy: Traditionally, the Uygurs live on farming, with some engaging in commercial businesses, animal husbandry and handicraft. Diet: Wheat flour and rice are traditional staple foods. Favorite foods include milk tea, pita bread and stuffed buns. Culture: The Uygurs have a long and rich cultural tradition. Among writings passed down are the Turkic Dictionary and Kutadolu Bilq (Blessings and Wisdom). The serial epic Twelve Mukams is well-known, as are a variety of dances and diverse musical instruments. Sports include “ran off with a sheep,” swing and wrestling. Maixilaipu is another popular form of entertainment combining music, narration and poetry. Holidays: The major Uygur holidays are Corban, Rosun and Noluzi. Religion: The Uygurs used to practice different religions, including Shamanism, Manichaeism, Nestorianism, Zoroastrianism and Buddhism. They started to convert to Islam in the early 10th century. 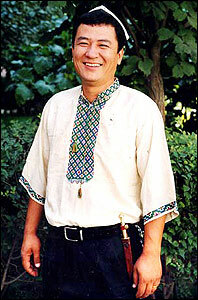 Costume: Traditional gowns worn by Uygur men are called Qiapan. Women wear primary colored dresses with embroidered skull caps. Nowadays, they tend to wear Western-style clothes. Marriage: Monogamy is the norm among Uygurs. Conventionally, meticulous arrangements had to be made by the bride and groom’s parents – matchmaking, proposal, betrothal gift negotiation, betrothal ceremony, a religious ceremony and the wedding itself. Ceremonies would be grand events lasting for three days. Both the bride and groom’s families give dinner parties during the wedding, and guests would present gifts to the newly-weds. Residences: Uygurs’ homes are commonly wooden-framed adobe bungalows, but some better-off families build their own houses with a porch and carved or painted ornaments.